As two young PA Arab men are arrested for murdering five members of the Fogel family, the PA calls to release all terrorists. 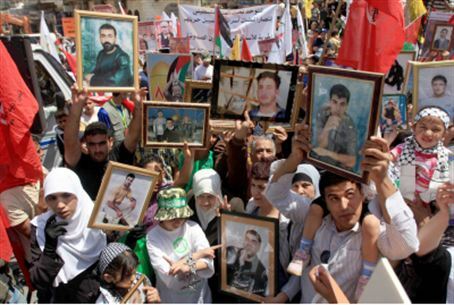 The Palestinian Authority called Sunday for the release of all PA Arab prisoners held by Israel, including terrorists and other murderers. PA Chairman Mahmoud Abbas announced that he will not make peace with Israel until all prisoners are released. Abbas' demand came as Israeli forces announced that they had captured two PA Arab men responsible for the murder of five members of the Fogel family in Itamar. He is asking for the release of the men, along with many others convicted of similar crimes. The face of the PA campaign for prisoner release, Nael Barghouti, is also a murderer. Barghouti has served 33 years of a life sentence for a murder committed in the course of a terrorist attack. He has spent the longest term in prison of any PA Arab, and is referred to as “dean of the Palestinian prisoners” or by the honorific “Abu An-Nur” (lit. “Father of the light”). PA officials referred to Nael Barghouti as a “political prisoner” during Sunday's events calling for prisoner release. Schools under PA rule dedicated one hour on Sunday to teaching students that all PA Arab prisoners should be released from jail. Mosques and churches joined the cause as well, calling to free prisoners in speeches and ringing the bells in a display of solidarity. In Gaza, Hamas called to secure the release of PA terrorists by kidnapping Israeli soldiers.